It is an usual thing that my mind badly craves for some snacks when nothing is available at my pantry to munch. The recipes take less than 5 minutes to prepare, saves me in those situations. What about a mug cake at that moment? You can find a grin at my face and if it is a chocolate one, I definitely feel overwhelmed. 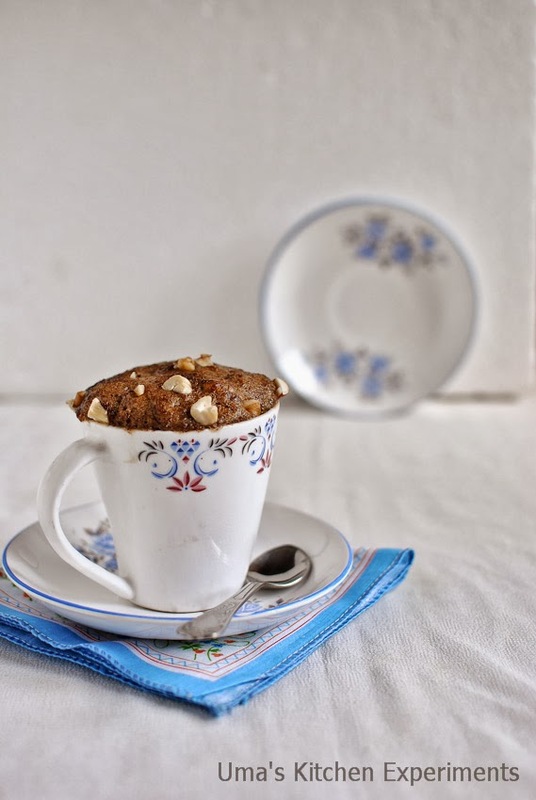 But badly, I didn't have flour to make it and I ended up preparing this flour less muffin or mug cake. Since this cake calls for very limited ingredients, it can be prepared totally in 3 minutes. Instead of granulated sugar, one can use artificial sweetener for diabetes friendly. You can even go for savory version by skipping the sugar part. The original recipe used cinnamon powder which I excluded and added roughly crushed mixed nuts (cashews, walnuts and almonds) for a crunchy taste. 1) Take a medium sized microwave safe mug. 2) Add flax seed powder, baking powder, Egg, Sugar and oil one by one. Mix well. 3) Add roughly crushed nuts and mix again. 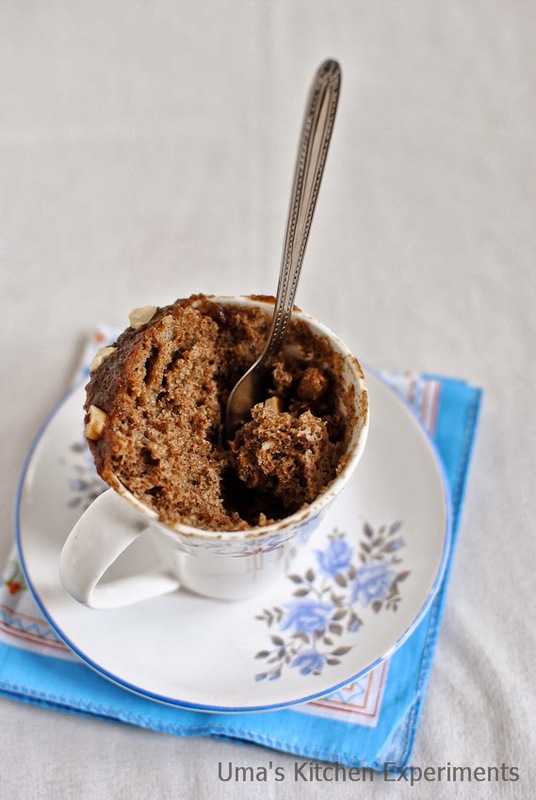 4) Top it with a teaspoon of nuts and Microwave it HIGH for 1 minute. 5) Muffin looks very moist the moment you take it out from Microwave. So, Cool it for few seconds before serving. 1) Instead of nuts, use berries, fruits or spices. 2) The muffin was soft and moist when it is consumed warm. If you keep it as such for sometime, It becomes dry. So, try to consume the muffin when it is warm. 3) If you have a sweet tooth, feel free to add one more tablespoon of sugar along with the given measurement. 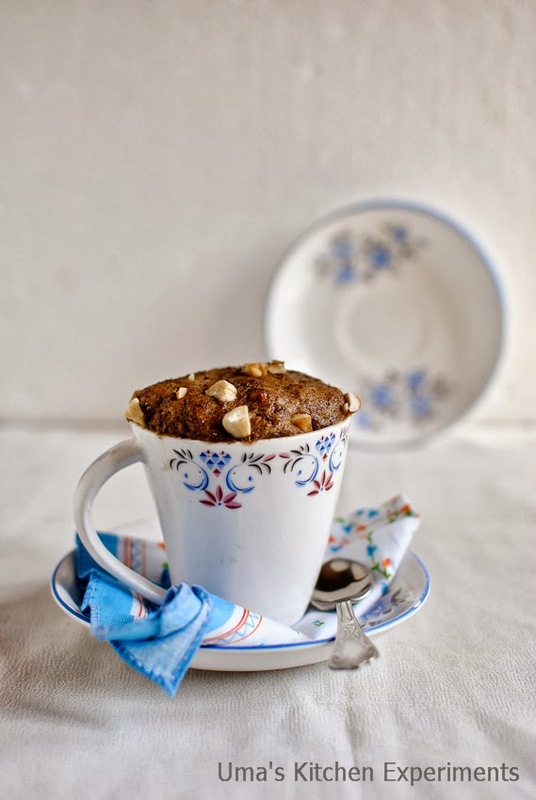 very tempting and looks very moist too..
Wat a prefect,healthy and fibre rich muffins, love this single serving..
awesome. Well explained and nice clicks too. 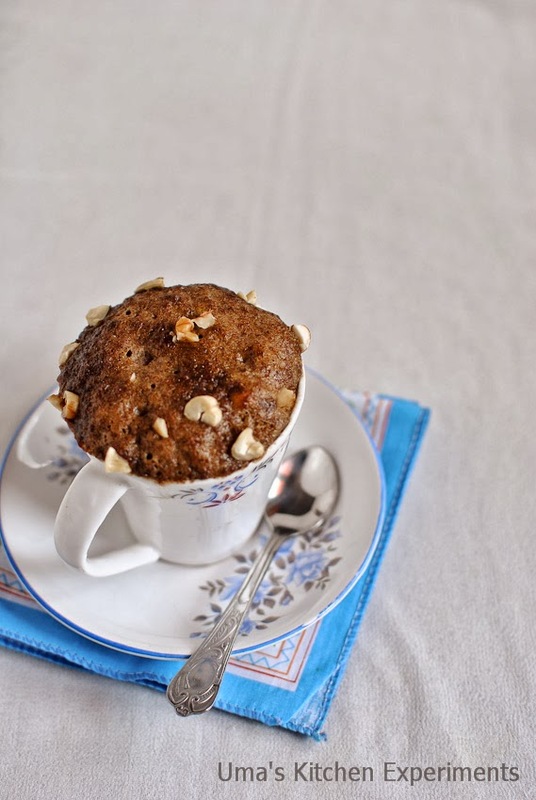 Healthy 1 minute muffin... First time here, happy to follow you.